After the vApp is deployed, you must do several things to properly configure vCenter Operations to get everything working. You should complete the configuration before deploying the integration to VMware View. To configure vCenter Operations Manager, you must log in to the UI virtual appliance. To determine which IP, you should browse to select the UI VM from your Hosts and Clusters view in the vSphere client and note the IP address on the Summary tab under the General section. When you have the IP address, browse to the appliance using a web browser, that is, http://[IP Address]/admin. The default username for the vCenter UI Console is admin, and the password is admin (see Figure 7). Figure 7. Log in to configure vCenter Operations. After you log in, the registration wizard begins. It prompts you to reset the default password and register your vCenter Operations application with vCenter. 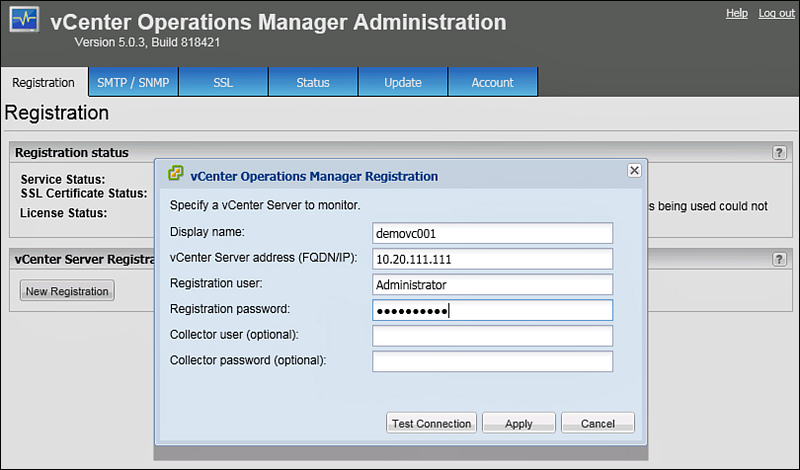 You can have vCenter Operations monitor several vCenter Servers, so multiple registrations are allowed. To register a vCenter, provide the IP and an account that has access to everything (typically, the administrator). When you are registered, your vCenter configuration should look similar to Figure 8. Figure 8. Register the vCenter Server. You also need to configure SMTP if you would like to have alerting enabled in the vCenter Operations application. To configure it, click the SMPT/SNMP tab and enable Enable Report Email Service; then supply the SMTP Server address and port (typically port 25). Also provide a default sender name and default sender e-mail address that the alerts will come from. To save the configuration, click Update.